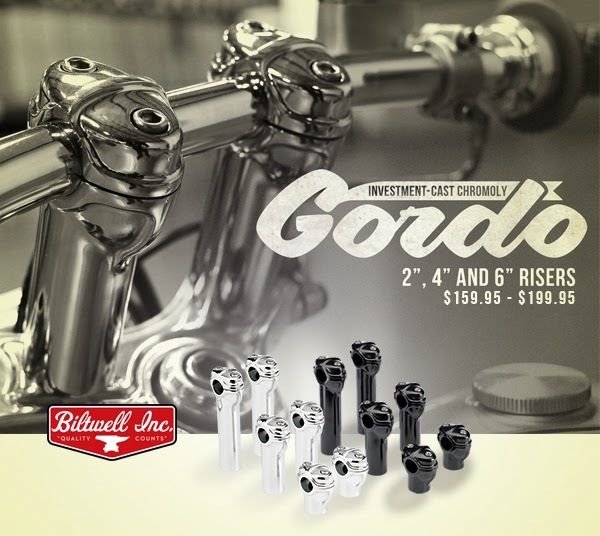 Check out the new thick n' chunky Gordo risers. The through-bolt design makes 'em a logical choice on springers that accept a 1/2" bolt. 2", 4" and 6" sizes available in black or chrome. The Shark Raw is a helmet with a distinct design, a mixture of a skull and the monster enemy in a spectacular first person shooter. It will surely not appeal to everybody! For those that like a bolt statement, the Raw is a great urban helmet with all modern features and safety aspects you'd expect of a leading European helmet manufacturer as Shark. The base is an open face helmet with a flip-up facial protection mask and a scratch resistant integrated goggle. On the inside the anti-fog layer helps with a continuous clear vision, even in more adverse weather conditions. The Micro Lock buckle system insures you'll get it on & off, without hassle. When it's all said and done, take out the detachable inside, place in a washing net and cold cycle it in your washing machine. Your Shark Raw is Fresh & Ready for new adventures! Available in Gloss Black, Gloss White Azur, Matte Black Metal, Matte Green and Gloss Orange/black striped in sizes from XS to XL. Other Shark helmets, like the EvoLine series 3 (jet / full face helmet) or the Shark RSJ series (jet helmet) are available as well, obviously all are EC approved. For more information get the brand new 256 page Lifestyle & Clothing catalog from Motorcycle Storehouse, or have a look online at motorcyclestorehouse.nl and talk to your dealer.